Newheim the Portly is a Nord barbarian living in Anvil, and the current harbormaster on the dockside. A valuable heirloom—a mug that keeps his drinks cold—was stolen from him by thieves, and he wants it back. Due to his duties as harbormaster, Newheim spends quite a bit of time on the Anvil dockside. After waking up at 6am, he spends two hours relaxing in his house, then ventures down to the docks, where he typically strolls around near the Sea Tub Clarabella, often in the company of his good friend Heinrich Oaken-Hull. At 6pm, he returns to his house for a two-hour dinner, then wanders around until his bedtime at 10pm. On Sundas, he skips the dockside and spends the day, from 8am to 6pm, walking around downtown Anvil. Newheim wears a set of middle class clothing: a blue & green outfit with a pair of quilted shoes. He carries his key and some gold. When you approach Newheim for the first time, he will politely introduce himself and his various activities on the dockside: "I'm Newheim, Anvil harbormaster. I'm responsible for all harbor traffic, docks, duties and fees in Anvil harbor." When asked about Anvil he will elaborate: "Traffic through Anvil harbor comes mostly in exotic, high-profit goods easy to transport by road or Mages Guild couriers to eastern markets." However, not everybody thinks highly of the harbormaster. Wilhelm the Worm will, when asked about Anvil, say: "Nice, friendly folk in Anvil, even the Countess greets me in the street. Well, except for that Newheim the Portly. He's a mean old scroat." During the quest Den of Thieves, Anvil residents will point you and Maglir towards Newheim with the words: "Can't say I know anything myself, but I heard that Newheim the Portly had some things stolen, and he's been asking around about it. Ask him." Eager to progress with the quest and get his reward, Maglir will comment: "Let's find this Fat Newheim guy. Whatever his name is. He apparently knows where these bandits are." When approached, Newheim's greeting will now be different: "Hail! What can Newheim the Portly do for you?" On the subject of Thieves, Newheim will tell you the story: "Aye. I know about those scum. Rotten bastards robbed me blind, they did. Stole a family heirloom. Bunch of Bosmer, if you can believe that!" 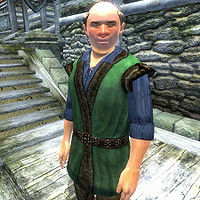 Since Maglir is a Bosmer, his next statement will vary depending on your race: "No offense to (you or) your friend, of course. Last I heard, they were holed up in Hrota Cave, not too far from here." And he is more than happy to elaborate on his missing heirloom, thus initiating the sub-quest Newheim's Flagon: "Took my flagon, they did! Passed down to me from my father Rulf, and from his father Torbalt. It's a wondrous cup. Keeps ale cold and sweet. Been drinking from a lousy wooden tankard since. It's just not the same. If you can find it, you'd have the gratitude of Newheim the Portly!" On Hrota Cave he will just say: "You'll find it north of Anvil. Good luck, and give it to those bastards good." When you exit conversation, he will add: "You go get 'em! And whip their asses for Newheim!" Approaching Newheim after learning about the missing flagon will have him mutter about the theft: "Bastards. Take my flagon...." When you return from the cave with his heirloom in hand, Newheim, apparently a beer brewer in his spare time, will hand you three bottles of his special brew as a reward: "Ah, you've got it! Thank the gods! Finally, my mead will stay cold and won't taste like goblin piss. Take these, and my thanks." Asking him about the flagon again will have him once again thank you for returning it: "I can't thank you enough for returning it, friend." Den of Thieves: A gang of Bosmer thieves has been causing some problems around Anvil. Newheim was supposed to take a two-hour lunch break at the Count's Arms every day at noon, but his wander packages always take precedence. Esta página foi modificada pela última vez à(s) 05h37min de 20 de outubro de 2015.